A massive block-long series of warehouses along 8th Street in the Limerick / SoBro neighborhood is scheduled for demolition. The Cook Compression Company, a subsidiary of the multinational Dover Corporation, has applied to raze the buildings and the 30-day stay of demolition period is ticking. Individually, these buildings make up a varied streetscape between Kentucky and Breckinridge streets and date as far back as the late 1800s. 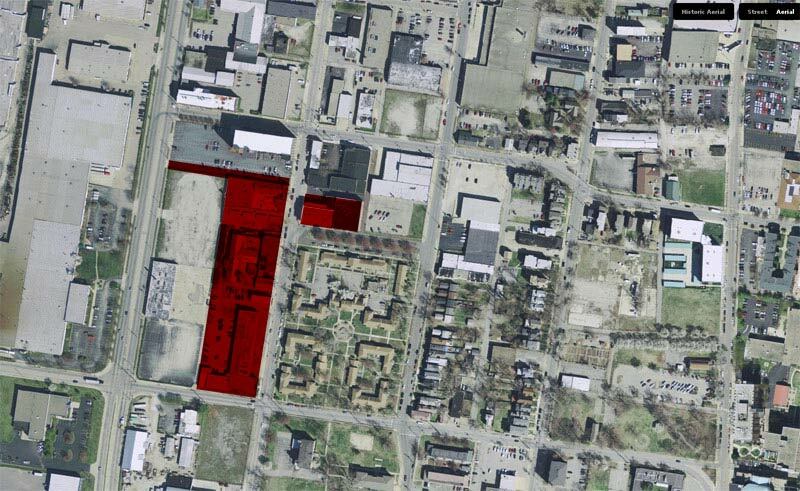 All but one small modern warehouse on the Cook / Dover site is scheduled to be destroyed in the area marked in red on the map below. Each segment of the property is unique, creating a pleasant streetscape along 8th Street that could have provided a backbone for a mixed use center for Limerick. Interestingly, the suburban-style apartments across the street from these warehouses was once home to Eclipse Field, the venue of big-time baseball in Louisville. A block-long street between 7th and 8th streets with a park-like median through its center actually dates to at least the turn of the century, but I’m not sure why it was built here. 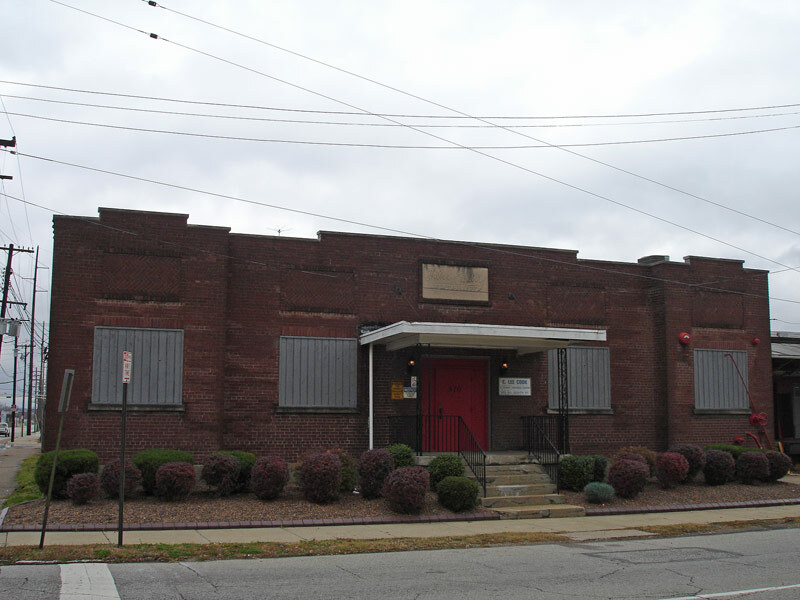 Cook Compression was founded in Louisville as the C. Lee Cook Manufacturing Company on the same site as these warehouses (916 S. 8th St.) in 1888 by Charles Lee Cook when he was only 17. Cook was an inventor who made great advancements in train technology that are still in use today. Polio-stricken and bound to a wheelchair, he built a unique house in 1926 in Old Louisville at Sixth and Ormsby that is surely one of the first handicap-accessible buildings in the city. Today, Dover is headquartered in that vast morass of suburbs called Chicagoland and Louisville isn’t mentioned at all on the Cook Compression web site. As the C. Lee Cook company grew, it acquired neighboring properties on the block, eventually stretching all the way to Kentucky Street where a one-story building at 970 South 8th St. marked Huber and Huber trucking company in stone above the door. Directly north of that is an old loading terminal set off the street slightly (below) that could have made a great farmers market. The rest of the buildings are more traditional one-two story buildings forming a distinct urban edge along the sidewalk. There’s currently no protection for these buildings as they do not sit within a historic district, even though they are eligible for the National Register listing. Louisville’s industrial legacy has been under direct attack recently and there’s little reason to believe these buildings could be saved. Destruction of these early industrial structures is a tremendous loss for the city, especially en masse, as this typology is the most readily and affordably transformed into other vibrant uses. No word on what Cook / Dover plan for the site. This is the fourth large scale demolition in the West End this year. This is simply unacceptable! Someone needs to get city hall on the phone and get em to come up with a master plan for this area, because at this rate it won’t last much longer. Is this the West End? Maybe not, but it is a shame that this property will be destroyed. I am afraid that we cannot count on City Hall or our clueless Mayor. The one older building looks good, but the others are fairly nondescript. I think that housing project across the street is College Court? If I recall right it is the oldest public housing project in the city, and, despite it’s age, is fairly humane of a design compared to the barracks that Louisville usually put up for housing. BTW, good company history. Thanks! My father, Russell “Joe” Swiger worked at this company for many years and still worked during a heart attack. He had to medically retire and died in August of 1999. I worked here through a temporary service for a short while in 1990. I have a lot of memories of this company and those buildings. I hate to see them demolished. This isn’t the West End. It is Limerick. It is near central downtown Louisvile just past Old Louisville. This building is now gone as the demo company is hauling the last of the debris away. I have a similar building in the same area. If someone wants to buy it and save it, I will sell it to you. It’s great rental space and I am almost at 100% capacity. I find it interesting that trend is away for the heavy industrial use of these properties and being used more for the arts now. Oh, I believe College Court used to be a housing project and is now condominiums. Yep, Limerick and SoBro (SOuth of BROadway) neighborhoods. hello i found out via thru a friend today that cardinal insulation are going to demolish all of it starting sept 17th 2012,where can we sign? And now it’s just a gravel lot….